Recently the zombies have taken a back seat... to Skaven of all things. 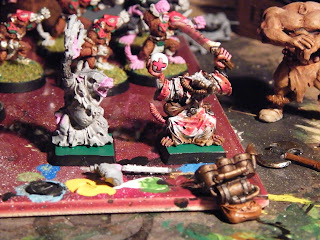 I have always hated painting fur and this has made Skaven a bit of a challenge. The reason I have always had a problem with fur is that it is so frustrating to try and get the paint to sit in the recesses of the sculpt without putting in so much as to obscure them. I still haven't managed to find a solution to this problem, although using a slightly thinner paint helps get into the recesses it results in a poor coverage of the raised areas. I would suggest this followed by at least 2 layers of highlighting to make sure that the raised areas do get covered. I have mostly completed the apothecary, only needing to give him a thin green wash of noxiousness and base him with some flock. 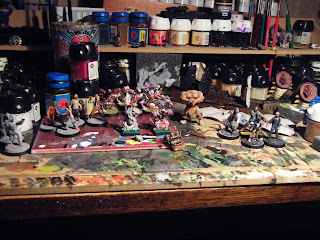 Speaking of basing... you might well be wondering what the hell is up with the bases on those Skaven... 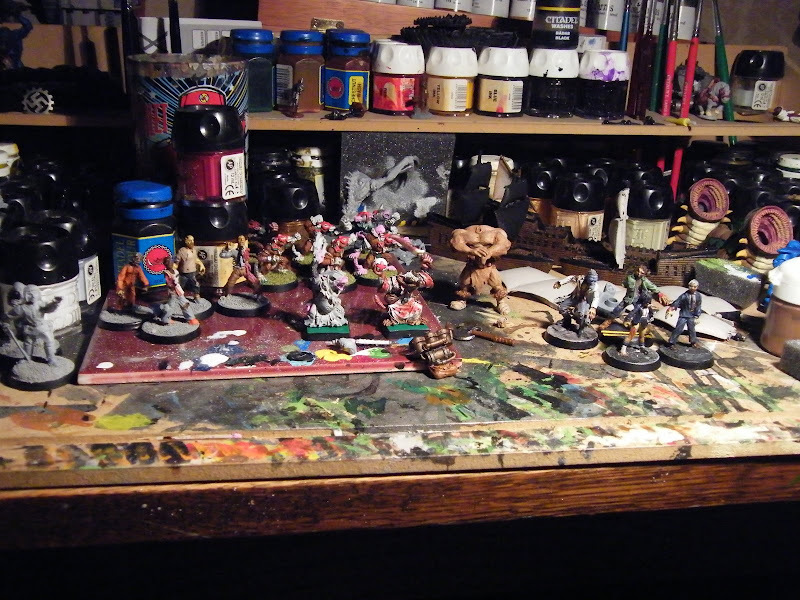 I started painting them several years ago and there were some problems with my painting skills and I am now having to try and keep the theme whilst making the newer minis nicer. One of the sacrifices that I've had to make in the name of continuity is the horrible basing (and also the silly skin tones). 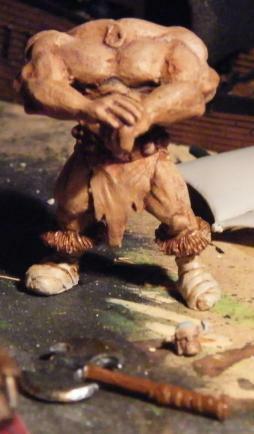 I have also made some progress on Thrud the Barbarian. I am loving painting this model, it is a really good model to really get practice in painting flesh, there is just so much of it, and the sculpt really shows off the shading aspect. The fact that it is so much bigger than a standard 28mm mini or even a 32mm heroic standing at some 54mm high, makes it a lot easier to paint as the details are effectively twice the size. The axe is a really nice sculpt as the metal blade has been sculpted as slightly scuffed, really helping it to feel real and making it very easy to paint up to a high standard. 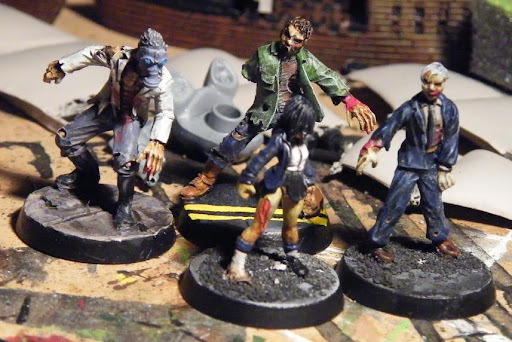 As for the zombies, well as you can see from the images below I have made a little progress, but nothing much. 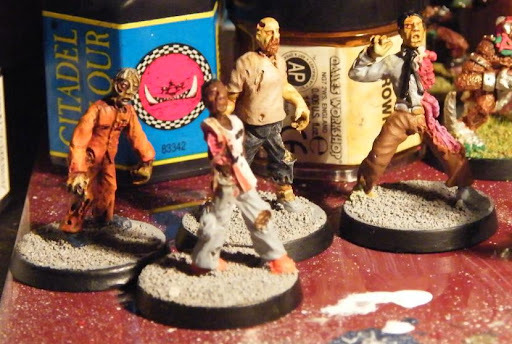 Suzi is now done although I still have to varnish her and the other 3 completed zombies. 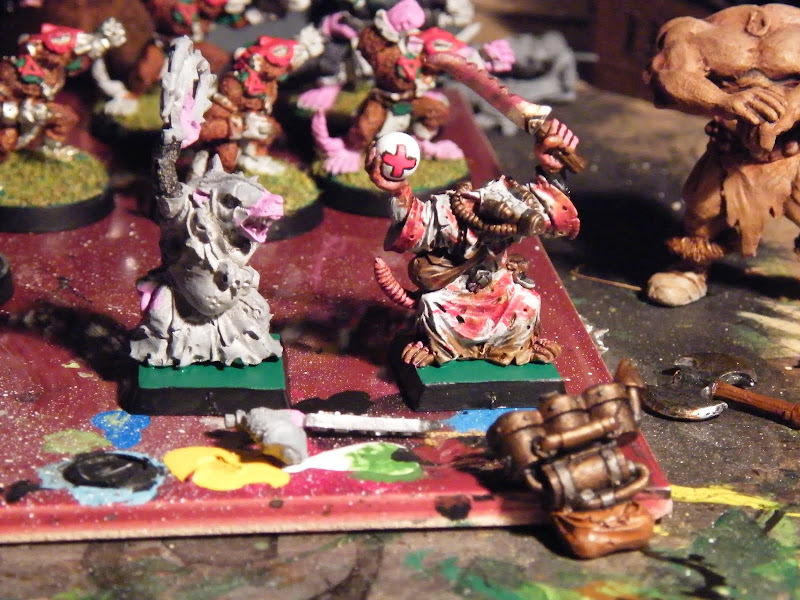 very nicely, it is just that I have suddenly decided to focus on the Skaven... it was all the fault of the Apothecary back-pack (you can see it at his feet in the image above)... I really enjoy painting metal... sad isn't it?... and I also wanted to test using a basecoat of brown for copper/brass as in my opinion GW brass and copper have always had terrible coverage, this is improved a lot with a brown basecoat and although I still needed to paint 2 layers of the brass to get a fully even coverage, even after a single layer it would pass the mustard for rank and file troops. The ZIPs have now got the first layers done and most of the shading is done really all I have to do is fine detail, black lining and highlights... talking about it is making me want to get on with it!